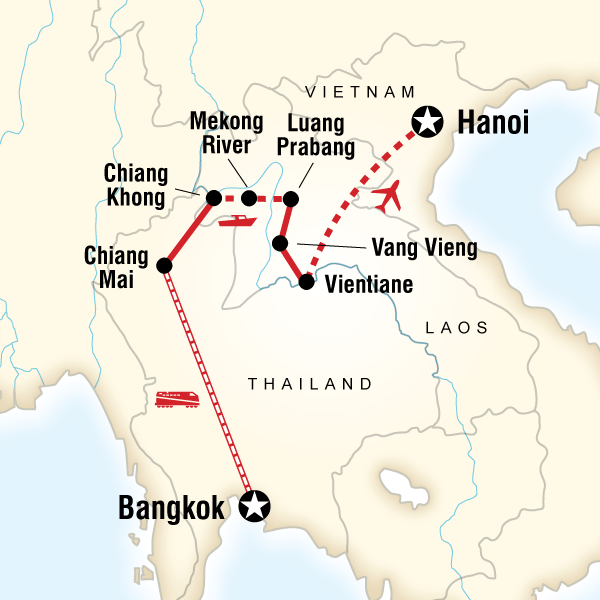 From the energy of Bangkok to the calm of Laos, this trip is a study in contrasts. Visit temples in Chiang Mai then spend the evening exploring the night market. Sail the Mekong into the heart and soul of Laos. An experienced CEO will make sure you get the most of your tour, but will leave plenty of time for you to do your own thing. We utilize many forms of transport—both public and private—to maximize time spent exploring the history and culture of this unforgettable region. Train, local bus, air-con bus, boat, songthaew, cyclo, plane. 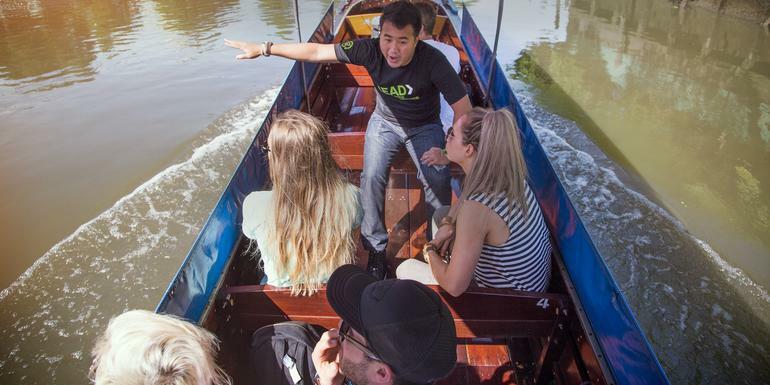 Guided longboat tour of Bangkok’s klongs and Wat Po. Optional Grand Palace and National Museum visits. Overnight train to Chiang Mai. Enjoy a guided tour of Doi Suthep temple. Optional activities include a cooking class or visit to the night market. Head to Chiang Khong via Wat Rong Khun and enjoy the view of the mighty Mekong. Cross the border into Laos then travel by traditional boat down the Mekong River. Continue down the Mekong for most of the day. Take a guided tour of the Pak Ou caves before arriving in Luang Prabang. Enjoy a guided tour of the Ethnology Museum and Kuang Si waterfalls. Enjoy a free day exploring all Luang Prabang has to offer. Options include cooking classes, temple visits, massages, night market shopping, bike riding, and hiking. Enjoy dinner with a local family in the evening. Spend the night in a local village enjoying traditional Laotian food. Sleep and eat like a local. Explore the capital of Laos. Opt to visit temples, see the National Museum, or explore highlights of the town. Fly from Vientiane to Hanoi. Visit Ho Chi Minh's Mausoleum, stilt house, and Presidential Palace. Enjoy an included water puppet show. Opt to visit the Temple of Literature, museums, and Hoa Lo Prison.